What is the Difference Between a Radial Lift Skid Steer Loader and Vertical Lift Skid Steer Loader? Nowadays, construction equipment manufacturers are tailoring their machine specifications to customer’s exact needs and applications. 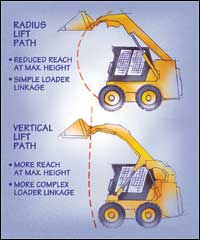 Take the skid steer loader as an example. If you’re in the market for a skid steer, you have a couple of different options to consider before making your purchase. 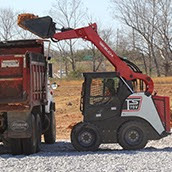 Well known earth-moving equipment manufacturers like Takeuchi, now offer two different types of lift-arm designs, the radial lift skid steer loader and the vertical lift skid steer loader. You will often see “R” or a “V” after the model number to differentiate between the two. Keep in mind, both machines are capable of performing the same exact task, one of them just does it better and more efficiently. The loader arms are located at the very front of the skid steer loader and are designed to hold a variety of attachments, usually a bucket, but can also be an auger, sweeper, dozer blade, pallet forks and breaking hammers, to name just a few. arcs until the bucket was about 3 feet off the ground. Performance is virtually identical when the loader arms aren’t raised. At the end of the day, the decision to buy a radial lift skid steer vs. a vertical lift skid steer comes down to how you intend to use the machine. One of the more popular choices are the Takeuchi TS70R and the Takeuchi TS70V.